An August 2007 performance of "Romeo and Juliet" by Shakespeare in Clark Park. 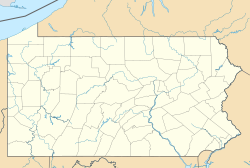 Clark Park is a municipal park in the Spruce Hill section of West Philadelphia in Philadelphia, Pennsylvania. Its 9.1 acres (3.7 ha) are bordered by 43rd and 45th streets, and by Baltimore and Woodland Avenues. The park was established in 1895 on land donated to the city by banker and West Philadelphia developer Clarence Howard Clark, and was known in its early decades as "Clarence H. Clark Park". Today, the park has a basketball court, playground, an open field, and many paths. It holds a life-sized 1890 sculpture of Charles Dickens, one of just two known statues of the author. It is home to the Shakespeare in Clark Park theatre company. The park also hosts Philadelphia's largest year-round farmers' market, which runs once or twice a week, depending on the season. During the American Civil War, a small portion of the land that would later become Clark Park was occupied by the southern tip of the 16-acre grounds of Satterlee Hospital, one of the largest Union Army hospitals. Some 60,000 Union soldiers were treated at the medical facility, which was torn down after the war. A prominent feature of the park is its "bowl", once a mill pond that powered a paper mill and another mill to the south. An ice house sat near its southern tip. The pond was fed by Mill Creek, which ran through a ravine between 42nd and 43rd Streets, was dammed above Woodland Avenue, and emptied into the Schuylkill River. The mills were closed in the 1860s. As the area shifted from farmland to residential, over the next decades, the dam was removed, the creek was buried to make it easier to build houses, and the pond dried up. In the 1890s, the land was used as a public dump. To place on the public plan for park purposes a plot of ground in the Twenty-seventh Ward, to be known as Clarence H. Clark park. Section 1. 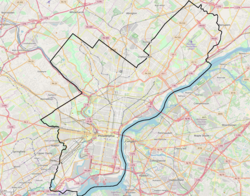 The Select and Common Councils of the City of Philadelphia do ordain, That the Department of Public Works, Bureau of Surveys, be, and is hereby authorized and directed to place on the public plan for park purposes that certain lot of ground situate between Forty-third and Forty-fourth streets and Baltimore avenue and Chester avenue, to be called Clarence H. Clark Park : Provided, The owners of property first enter into an agreement satisfactory to the City Solicitor, to dedicate the same to the City on the payment of the amount paid by them for street improvement, sixteen thousand nine hundred and twenty-five (16,925) dollars and thirty-five (35) cents. The ordinance was passed on June 8, 1894, and the deal was done. In Clark's deed, he restricted the land to be used solely as a park, and he said that he wanted the park dedicated to children. The first portion of the park was dedicated on January 18, 1895. In November 1898, the area south of Chester Avenue was added, giving the park today's 9.1-acre form. The Dickens sculpture, by New York City sculptor Francis Edwin Elwell, shows the 19th-century author and one of his characters, Nell Trent of the novel The Old Curiosity Shop. The work was commissioned in 1890 by Stilson Hutchins, who soon pulled out of the deal. Elwell nevertheless finished the sculpture, which won a gold medal in 1891 from the Art Club of Philadelphia and two gold medals at the 1893 World's Columbian Exposition. In 1896, the Fairmount Park Art Association (FPAA) bought the sculpture for $7,500 ($225,870 today); it was placed in Clark Park the following year. By 1908, the association was receiving, and rebuffing, requests to move it to a more prominent place in the city. The Gettysburg Stone, a monument to the 60,000 Union soldiers treated at Satterlee Hospital, on whose southern tip the stone was placed in 1916. In 1915, D. A. Conan, of 1345 Arch St., won a $5,000 contract to lay 3,000 yards of granolithic walkways in the park. In June 1916, a large stone from Devil's Den at Gettysburg Battlefield was set up in the park to recall the Union soldiers treated on the site and the "services of the patriotic men and women" who cared for them. The stone sits near the park's northwestern corner, which was once the southern tip of the hospital grounds. In June 1961, the city spent $40,000 ($335,367 today) on park improvements, adding a basketball court, shuffleboard court, checker tables, a tot-lot, two drinking fountains and general landscaping. The Friends of Clark Park (FOCP), a nonprofit volunteer organization, was founded in 1973 to help maintain the park. Yet the 1970s and '80s saw park maintenance steadily decline; no major capital projects were completed except for normal repairs and the installation of playground equipment in the early 1980s. In November 1989, the figure of Little Nell was torn from its pedestal and thrown face-down by vandals. FOCP raised money to do the repairs, which were overseen by the Fairmount Park Art Association, and requested additional lighting to illuminate the sculpture. By 1998, "Trash and broken glass surrounded the Dickens statue and littered the park. More than once, the neighbors fought the city just to get the grass cut. Lacking lights, the park was off-limits after dusk except to drug dealers and their prey," wrote Judith Rodin, the president of the nearby University of Pennsylvania, which was heavily involved in gentrification efforts in the neighborhood. That same year, regional farmers began offering produce and other products at the Clark Park Farmers' Market. In 2000, FOCP, the Recreation department, and the non-profit University City District organization agreed to raise private maintenance funds to supplement municipal efforts. The agreement launched an annual “Party for the Park” fundraiser, which helps underwrite the cost of landscape maintenance and fund a small, but growing maintenance endowment. Between 2000 and 2006, the trio raised more than $300,000. The partners sought and received $55,000 from the William Penn Foundation to develop a master plan for Clark Park, which was delivered in 2001 after a nine-month effort by community-based steering committee and landscape architects. Among its fruits: a comprehensive assessment of the park's 305 trees by the Morris Arboretum; two new playgrounds, one of which was built with private funds; and plans to rebuild the basketball court. The master plan also calls for a central plaza where chess players now gather around the flagpole, improvements to the Dickens and Gettysburg Stone areas, and sidewalk and lighting renovations. The plan envisions replacing the parking lot next to the basketball court with green space for the University of the Sciences in Philadelphia, which leases the space and the adjacent Rosenberger Hall. Major renovations to the northern section of the park, dubbed Park A, began on September 7, 2010: improvements to lighting, green areas, paved paths, and drainage. The work was slated to finish in November; it was actually completed on June 16, 2011. The farmers’ market operates at 43rd Street and Baltimore, offering produce and other products from regional farms once or twice a week. From May through November, the market is open on Thursdays (3 to 7 p.m.) and Saturdays (10 a.m. to 2 p.m.); the rest of the year, on Saturdays (10 a.m. to 1 p.m.). The market is run by a pair of non-profit organizations: The Food Trust and University City District. Since 2008, the vendors have been equipped with wireless Electronic Benefit Transfer devices set up by the U.S. Department of Agriculture that allow customers to pay with credit and debit cards and food stamps. On February 7, fans of Charles Dickens, led by the Philadelphia branch of the Dickens Fellowship and Friends of Clark Park, meet at the statue to celebrate the writer's birthday. ^ a b Journal of the American Medical Association. ^ Malkin, Bonnie (14 March 2011). "Rare Charles Dickens statue restored to Sydney park after 40 years missing". The Telegraph. Retrieved 2011-03-14. ^ Shakespeare in Clark Park, shakespeareinclarkpark.org. ^ a b Food Matters, a publication of the Food Trust, Fall 2008. ^ a b c "Philadelphia - University City Historical Society". ^ a b "West Philadelphia: a study of natural social areas". ^ "Studio 34's Eponymous Trolley, or, A Short History of Route 34". Studio 34: Yoga Healing Arts. 2008. Archived from the original on 2008-07-09. Retrieved 2008-03-11. ^ Peniston, Bradley (January 14, 2014). "What's In A Name: Clark Park". Hidden City Daily. Philadelphia. Hidden City Philadelphia. Retrieved November 19, 2015. ^ Journal of the Common Council of the City of Philadelphia, Volume 1, 1894. ^ a b c d e f Simone Jaffe Collins (April 2001). "Clark Park Revitalization Project" (PDF). Master Plan. Philadelphia, Pennsylvania: Friends of Clark Park / University City District (Draft, April 2001): 5. Retrieved 2013-10-23. ^ a b c d e Byers, Fran; Cynthia Roberts (Spring 2005). "Clark Park: Then and Now" (PDF). The Quest. Philadelphia: University City District (Spring 2005): 1. Archived from the original (PDF) on 2011-07-21. Retrieved 2010-09-22. ^ "Dickens and Little Nell" (PDF). The New York Times. September 17, 1893. ^ "Dickens and Little Nell, (sculpture)". Save Outdoor Sculpture, Pennsylvania, Philadelphia survey. 1993. Retrieved August 14, 2011. ^ Philadelphia (Pa.). Councils. Common Council (1907). Journal of the Common Council, of the city of Philadelphia, for ..., Volume 1. J. Van Court, Printer. pp. 130–131. Retrieved May 1, 2012. ^ Rodin, Judith (2007). University and Urban Revival. Philadelphia: University of Pennsylvania. p. 73. Retrieved April 4, 2011. ^ "The Daily Pennsylvanian - - Clark Park renovations begin after delay". ^ "SNAP Monthly Benefit Issuance Schedule - Food and Nutrition Service". Wikimedia Commons has media related to Clark Park, Philadelphia. Friends of Clark Park, a non-profit corporation and volunteer organization founded in 1973 to help maintain and improve the neighborhood's largest public green space. "A LARP In The Park: Swordsmen and sorcery in West Philadelphia", 34th Street magazine, March 25, 2010. Article about LARPing at Clark Park. University and Urban Revival by Judith Rodin, University of Pennsylvania (2007), pp. 72-76. Describes efforts by UCD and FOCP to revive the park. 1912 photo of Dickens statue showing all young trees in Clark Park. This page was last edited on 7 November 2018, at 18:51 (UTC).